TRB conducted PGTRB Exams for the post graduate posts in Government schools. This PGTRB Exam written by lakhs of candidates every year. But only who were learned the entire syllabus can only attain the goal. These Exam questions are prepared in the view of testifying the depth knowledge of the candidates in his the her major subjects. 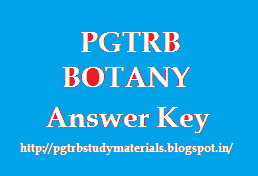 For Botany the question are from entire syllabus so the candidates must know the each and every line in the content. Our website provides you with a lot of question papers with Answer Keys.